Because commons are important to so many people, they can provide fertile ground for disagreement. Proposals by one group of interests can appear to sideline or even antagonise others. A Common Purpose was developed to help de-fuse this tension, and provide a more collaborative and consensual approach, recognising the value of commons to everyone. 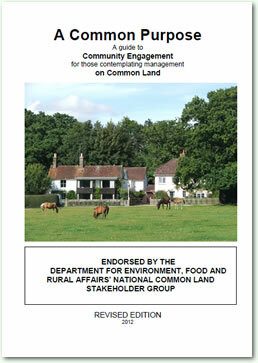 It provides guidance on how to engage with local communities for those contemplating management on common land. This revised version, backed by The Open Spaces Society, takes account of changes in legislation and builds on lessons learned since first introduced. - "If BHS feels so strongly, it should have piped up earlier" Kate Ashbrook, General Secretary, The Open Spaces Society. KATE ASHBROOK'S STATEMENT /RHETORIC IS FROM A PART RUN QUANGO. OSS IS A CHARITY, THEREFORE IT HAS GOVERNMENT FUNDING AND AS SUCH WILL NOT OPPOSE ANY PROJECT/STEALING ON AND OF COMMON LAND WHERE APPLICATIONS FOR HLS/ELS ARE PRIME REASONS FOR STAYING SILENT. LOOK AT THE MESS OUR OPEN SPACES ARE IN NOW, IF THAT DOESNT WAKE YOU UP NOTHING WILL, KATE ASHBROOK WAS/IS FULLY BEHIND THE TOTAL DESTRUCTION OF WHITCHURCH HEATH COMMON, HARTLEBURY COMMON AND THE ENCLOSURES AND APPLICATION MADE OR THAT ARE NOW BEING PREPARED BY COUNCILS TO OBTAIN HLS OR ELS, TWO VERY SERIOUS COURT APPEARANCES, ONE HEARD AND ONE NOW UNDER PREPARATION FOR CROWN COURT AND JURY, THESE BASTARDS WILL GO AS FAR AS IMPRISONING OR PUTTING MEMBERS OF THE PUBLIC UNDER FINANCIAL RUIN TO ACHIEVE THEIR CORRUPT AGENDA'S. OSS STILL SUPPORTS THESE ATROCITIES AS DOES NATURAL ENGLAND AND OTHER SO CALLED "CONSERVATIONIST", ALL ARE PART QUANGO, NATURAL ENGLAND IS A FULL BLOWN QUANGO, THINK ABOUT IT. Rights enshrined in law are now considered discretionary by those tasked with enforcing the very structure of democracy and in so doing our administration demonstrate anarchy beyond any riots or subcultures within my memory. I read Bob's commentary on the 'Common Purpose' document and found myself in total agreement with him and with no 'common ground' with NE and its fellow travellers that approach public access/recreation and education in a "take it on our terms-there are no others"! What I find particularly concerning is that rights enshrined in law are now considered discretionary by those tasked with enforcing the very structure of democracy and in so doing our administration demonstrate anarchy beyond any riots or subcultures within my memory. If one is achieved so too is the other but Public Inquiries,QUANGO's,WT's and LA's all obstruct equality through institutional bias,poor science and agenda lead impositions that are seen as more important than those that fund their purpose,lifestyles and mistakes. When ministers like Richard Benyon knows of,but fails to act on,established unlawfulness by his own department.When our Prime Minister responds to Her Majesty with confirmation of an inquiry into QUANGO unlawfulness but fails to do so.When Richard Benyon says he will meet me but fails to do so.When the disabled are disregarded with impunity then the only conclusion that can be drawn is that the public are held in contempt.Accountability is to be extinguished from the Oxford Dictionary and the meaning of consultation is to be changed to imposition through anarchy! - Access has been high jacked by the conservation lobby. Since when is the riding of bikes legal on a common for instance [p6] and why does 33% of commons with equestrian use equate with 'some'? Cause for concern is misleading as to historical use and management was always at the behest of the landowner and the rights a prendre, not as in the interpretation of NE today. Taking the production of the commons is not management burning was and is but that is always discounted by NE. It is interesting to read the Treasury rebuttal on Chobham that regard is not due regard ie a duty to act and it can be in the mind of the Inspector which then can not be challenged NE and the wildlife trusts carrying out the present consultations under 'A Common Purpose' have been shown to be ignoring the basic tenement of the document as NE has in all the cases I have come across this year already signed HLS agreements for grazing so in my mind the whole consultation process is a sham or should I say scam. The stated aim for the widest support [p8] is continually ignored by the management teams, NE in the agreements and the Planning Inspectorate seeking to meet NE targets on nature conservation and biodiversity targets rather than protecting all lawful public access rights. [See Chobham, Hartlebury and Hednesford Hill commons]. There is no flexibility on behalf of NE and the planning inspectorate in all bar two cases have acted to support NE even without scientific evidence as required by the EU Waddensee case. The case for displacement is even ignored in the revised A Common Purpose yet there is lots of anecdotal evidence such as Headley Heath Surrey and West Penwith Moor / Carnyorth Cornwall. Despite the stated aims in the principles they are invariably ignored by the consultants as the stated aim is to get grazing on the common and always it seems by permanent fencing supported by HLS. This position was clearly spelt out in Hartlebury even though Worcester CC misled the inspector in that the common was only a s9 vesting for protection and not owned. What is done when the consensus is overwhelming against is to say we have a duty under s28G then ignore the objections and implement the original HLS agreement with the support of the Inspectorate and the Treasury Solicitors. Page 11 is just pc speak for just this approach what a waste of money and everyone's time when the out come is set from the very start of the process and there is no chance for JR as all the boxes have been ticked - very clever. Kate Ashbrook, General Secretary, The Open Spaces Society writes to Bob Milton. If BHS feels so strongly, it should have piped up earlier. Says Kate Ashbrook, General Secretary, The Open Spaces Society. I'm puzzled as to why you've only just seen this, it's had lots of publicity, including on our website and in Open Space. A lot of people were involved in this, and Mark was at the NCLSG meeting in June where it was endorsed subject to any further comments within a period after that - and I did not receive any other than from the Foundation for Common Land. If BHS feels so strongly, it should have piped up earlier. - All it seems to do is support the continuing institutionalized discrimination against equestrians and the Pillar II fraud by government [local and national] by NE and the RPA paying for statutory duty through third party land management contactors. The publication has just become a tool in the NE box ticking that seeks to protect those involved from adverse public opinion. I am sure Mark will tell me but that does not answer the question re the points made or address the issue of the revision being in my opinion hijacked. All it seems to do is support the continuing institutionalized discrimination against equestrians and the Pillar II fraud by government [local and national] by NE and the RPA paying for statutory duty through third party land management contactors. I have had no response from anyone re the points raised below. I wonder why? Recent correspondence with equestrians in the Yateley area where a so called consultation is being carried out is a prime example of an agreement being signed before consultation and then despite hundreds of objections to the contrary the Wildlife trust just carries on regardless and will we have been informed be making an application for permanent fencing and grazing. No scientific evidential base as in Chobham; just the same unsupported say so from NE. Do you agree with Bob Milton ? E-mail and tell us your opinion.